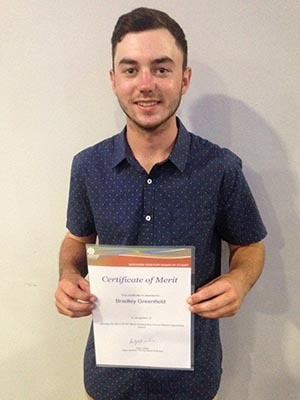 Centralian Senior College graduate Bradley Greenfield was awarded the 2017 GTNT Most Outstanding School-Based Apprentice Award, for his dedication in finishing his NTCET and Certificate III in Civil Construction and Plant Operation. The NT BOS awardee completed his schooling a year early, and has only a few units of his off-the-job component of his traineeship to finish before obtaining the certificate. Bradley travels to Darwin to undertake training with Charles Darwin University. He said the qualification will provide the wide range of skills and tickets needed to easily get a job in the sector. “With my tickets (machinery focused) I can go out there and operate everything without having to do any training,” he said. To manage his time Bradley said he split his week between school work and his apprenticeship. “I’d be working and completing my units for two days, and the other three days I would be at school and doing my assignments,” he said. Bradley started working on the weekend at Chambers Engineering Services before he was offered a traineeship with the company. He jumped at the chance to learn more, and hasn’t looked back. The ambitious teen said he was looking forward to continuing his study and learning about project management. “I want to start leaning about quoting, and being a team leader, and working out the logistics of it,” he said.